Kid's clothes get passed around and handed down, which is brilliant because up to a certain age, they aren't worn out by one child. But they can create quite a complicated organization project and overwhelm you. When someone hands you their trash bag full of hand-me-downs, you're grateful, but your heart sinks a wee bit. I developed the following method, through trial and error. As a result, I no longer run across clothes I'd stashed away, only to find my child bypassed that size long ago. Step 1 - When I'm given clothes, I go through them quickly in a like/don't like fashion. I do this when the kids aren't looking over my shoulder, loving and claiming what won't fit them for years. If I like something, I check for stains because most of the time, I don't want their clothes to start out stained. I'm already stain-removal impaired, so this is how I give myself a fighting chance. If it's not stained, I check the size and make piles of each. Step 3 - You can hang outfits for future seasons/sizes if you have space. Otherwise, I get them out of the way in a labeled tote. When someone grows into a new size or the season changes, I pull my tote out and see what I have and what pieces I need to buy. I recommend hanging because that's how I store my kids' clothes, with the exception of socks, underwear, undershirts, jeans and pajamas. It's a little work on the front end, right after laundry, but it makes life easier when they're picking something to wear. If it's a dress with tights, I hang the tights around the neck of the hanger. If a specific bow goes with it, I'll clip it to the lapel. As far as the shirts that go with jeans, I hang them with their matching jacket, sweatshirt or cardigan (this time of year). My kids know they can choose any of those to wear with any of their jeans. Also, here's what I do if I don't have a nifty pant hanger (below left). I loop a belt loop over the top of the hanger. 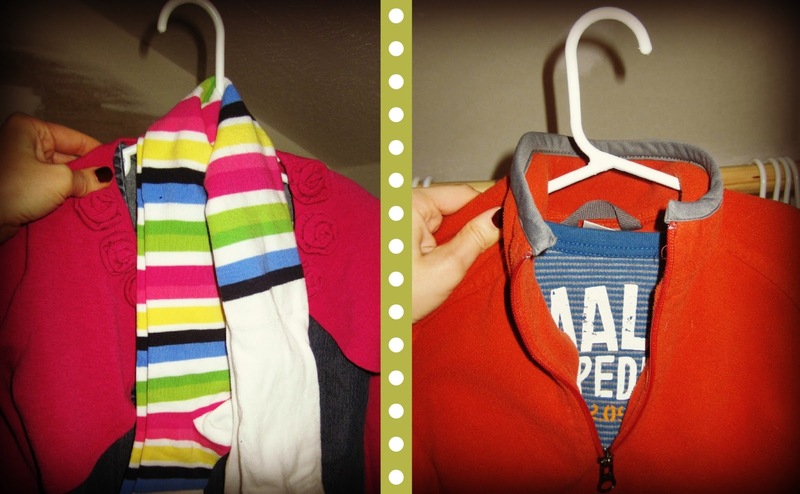 It takes up more room width-wise, but it works and it's easier for kids than folding the pants or shorts over the bottom part of a hanger. I save my nifty pant hangers for gym shorts and sweatpants that don't have belt-loops (above right). The other reason I recommend hanging is because you easily notice what isn't getting worn. If there are outfits they never choose, eliminate them. If you have way more dresses than your princess will ever wear, help her choose her favorites and get rid of the others. Also listen to the preferences your kids have and buy accordingly (as much as possible) to reduce potential for unused clothes. As far as hand-me-downs go, remember the right price (free) doesn't make it right or essential for you. Having hordes of clothes that don't match or are so-so is downright frustrating and overwhelming for little people too. I find my kids don't need the same quantities of clothing in winter because they play inside more and stay clean longer. I know this varies by age and messiness when eating, etc. but I'll give you the number of things my kids have now, at age six. She has a dressy coat too. He had one last year, but I haven't found him one this year. My kids have more than they probably need need, but with this amount, we can easily do laundry on Sundays only, which keeps my week simpler. That's my method. Hope it works for a few of you or gets your juices flowing so you can dream up one of your own! I just wanted to say a HUGE thank you for posting these tips. I just tackled spring/summer wardrobe planning with more ease than ever before. The biggest thing for me was letting go of the worry that I had to make every free item work. I narrowed things down to what I (and the girls) really like and what they will wear and it is looking good!